WWE: RAW 1/5/15! The Authority Returns! Celebrate good times, COME ON!! Order has returned to the WWE Universe with the reinstatement of the Authority! The first RAW of 2015 in Corpus Christi, TX, was a night filled with appreciation for those responsible, sweet retribution for those who dared to fight the inevitable and the first ever Ambulance match! So let’s do what’s best for business, and get this party started! Our night began with the entire WWE locker room filling and surrounding the ring. John Cena took center stage (as is to be expected since he can not stay away from a spotlight to save his life,) to address the events of last Monday that led him breaking his word to all present. He stated that he weighed the options of attempting to be Super Cena and decided that Edge’s life was more important than sticking to his convictions, and that he sincerely apologized for breaking his promise. Of course, this prompted the triumphant return of The Authority. Triple H and Stephanie reminded us of the chaos that had run rampant during their absence, all the wanna be’s who had attempted to replace them, and that thanks to one man’s constant struggle, they were back in power. Hunter and Steph then introduced the undisputed living breathing future of the WWE, Seth Rollins. These to warriors began the match evenly matched. Each attempting to out grapple the other before it turned into the brawl we knew it would. BNB came on strong and had the champ on the ropes on more than one occasion. But it was quick thinking on Ziggler’s part as he reversed Barrett’s Winds of Change into a roll up to retain his title. The former champion isn’t known to be a gracious loser and took out his anger on Dolph in a brutal beating that appeared to target the Zigman’s shoulder (reminiscent of what put Bad News out months ago). The newly reinstated Director of Operations, Kane, then made his way to the ring and apologized for being forgetful, but the title match was actually a 2 out of 3 falls match. The ref was instructed to ring the bell and the match continued. Dolph, who always looks good when he’s been beaten to a pulp, insisted on continuing the match much to the dismay of ringside doctors. BNB picked up a quick pin evening the score with his Wasteland. The third fall was hotly contested and it appeared that Dolph may retain as he began to rally against the challenger. But his title reign came to an end, when Kane provided the distraction that allowed Bad News Barrett to land the Bull Hammer Elbow making him a 5 time Intercontinental Champion. Such a fun match filled with a roller coaster ride of ups and downs and near falls. And for the first time, I saw Ziggler miss his drop kick (it was still beautiful though). The first match began slow and was disappointed at its length (that’s what she said <.<), but then all was made right and I was satisfied with the resulting other two falls. And always good to see that Wade knows what’s best for business. These local boys did not stand a chance. Viktor began the match against the newblet and devoured him before tagging in the monster that is Konor. The local yokel on the apron waiting to make the tag to his partner never had a chance as the larger member of the Ascension put him on the floor like the runaway freight train that he is. This set up the legal unknown for a Fall of Man that nearly broke him in half, allowing the Ascension to pick up yet another win. As much as I love to see Konor and Viktor destroy people, I am getting a little annoyed that they are not taking on teams their caliber. It can’t be that difficult to put them in a match against the Dust Brothers, or even the new team of Cesaro and Tyson Kidd. I have waited a long time to see these boys on the main roster now give them someone that actually presents a challenge! The sequel to perhaps one of the most disappointing matches I’ve ever seen, was only slightly better. 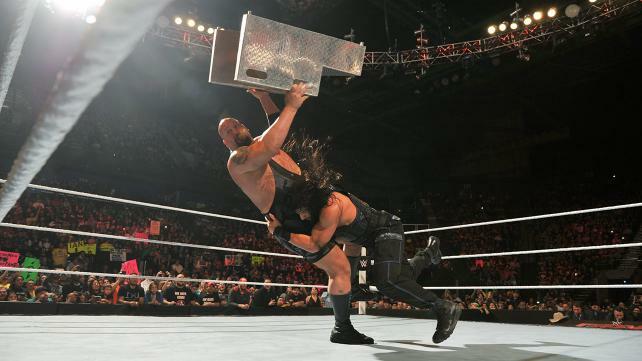 It was essentially a Roman Reigns beat down with Big Show targeting the powerhouse’s surgically repaired midsection. Most of the match was Show throwing Reigns about and shutting down any offensive momentum that threatened him. Just when it appeared that the Samoan Superman would turn the tables on the Giant, Big Show tossed Roman over the top rope onto the ground. The World’s largest Athlete then got himself disqualified after he used the stairs as a weapon. But he wasn’t finished. Big Show threw Reigns back into the ring (yes, literally picked him up and tossed him over the bottom rope) and was about to use the stairs again on the Juggernaut. But a quick spear from Roman upset those plans and the stairs landed on the Big Show’s head. So… I am now convinced that it really is the Big Show that drags down matches. Even though he owned most of the match, and admittedly, it was better than their first showing, it still wasn’t that great. Roman’s last two matches (Against Seth Rollins and Rusev) were good matches that showcased more of what he can do in the ring. This match with the Big Show, did nothing more than show us that he too looks pretty when he’s being knocked out (remember, I have issues.) The end to this feud can not come soon enough. It is doing Roman no favors and feels like it’s only around to make Big Show relevant. I’m begging you WWE, put Reigns in a feud where he can grow and not have the burden of making his opponent interesting. This match was a surprising treat I didn’t see coming. Of course, I love watching Nattie (who did not have Tyson at ringside, thank the Wrestling Gods,) and I love watching Paige. The Bella Twins, I can still do without. But the match itself was hard hitting and surprisingly aggressive. Natalya took it to the champ and looked strong as she dominated for a good portion of the match. The win was picked up by the Queen of Harts, who capitalized on the distraction of Paige taking out Brie Bella. I am now convinced that the Diva’s division is taking notes from the NXT women. Or it might be that Paige and Natalya are bringing NXT flavor to the blandness of the Diva’s main roster. I totally am seeing a Diva’s tag match in the works between the Bella’s and Natalya and Paige. I almost can’t believe I’m saying this, it’s a match that I am looking forward to. It feels as if the Bellas are responding to the pressure to be batter than they are. I still can’t stand them but Nikki did put on a decent showing against Nattie. And I have said it before, and I will say it again, Natalya is better without Tyson Kidd joining her at ringside. Keep it that way. In yet more wrongs being righted, former Wyatt family brothers faced one another in a savage battle officiated by special guest referees, Jamie Noble and Joey Mercury. It was Big Red Rowan in the beginning, dominating Harper. But J & J Security, unfamiliar with their new duties, accidentally messed up the count, frustrating the Sheep Mask wearing individual. This allowed the former IC champion to swing offensive momentum his way and hit his former family member with a huge clothes line that put Erick down. The referees enthusiastically counted the pinfall giving the victory to Luke Harper. Feeling cheated, Big Red attacked J & J Security drawing Harper back inside the ring after the match to again set the wrongs right. Jamie and Joey then impressed by delivering stereo drop kicks to a kneeling Rowan. It’s good to see that the Authority is righting the wrongs of Survivor Series in such a timely manor. As they stated, everyone would get what they deserved. The solidarity and unity of the Authority and those aligned with them should be respected and aspired to. This match and the resulting team work was a perfect example of how the Authority always wins. 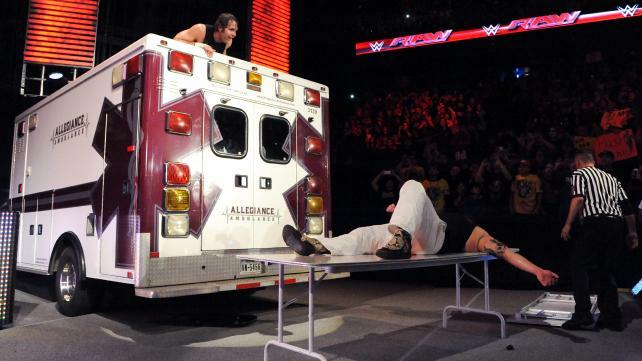 The first ever Ambulance Match to take place on RAW! It would be the final bout in a merciless rivalry dating back to Hell In a Cell. Bray Wyatt and Dean Ambrose exchanged strong words before the match, each vowing to make sure the other did not come out victorious. The only way to win the match was to beat your opponent senseless enough that you could throw him in the back of an ambulance and shut the doors. The match was vicious and brutal with the two trading blows and doing their best to tear the other apart. It was a back and forth war that spilled into the WWE Universe as the two made their way to the ambulance the first time. Inside the ambulance were tables that Ambrose used with abandon. He actually over came an injured knee to climb his way to the top of the ambulance and delivered a flying elbow onto a prone Bray Wyatt, putting him through the table. The Lunatic Fringe, however, caused more damage to his knee and this was all the Eater of Worlds needed to capitalize. Two Sister Abigails, (one directly into the closed door of the ambulance and the other onto concrete,) later and Wyatt shut the door on his feud with the Unstable one. An amazing match that had me screaming at my television. Mainly because I really wanted Dean to FINALLY win something. It’s like he’s come down with a case of the Sami Zayns (unable to win the big one.) While wins and losses may not mean anything to Dean, he needed to win this. Perhaps it’s my inner fan girl screaming but screw it, how long has it been since Dean won anything of note? The Miracle on 34th Street Fight? okay.. How about before that? Was it against someone who mattered? I’m getting really sick of Dean getting pinned (unless it’s Seth doing the pinning, then it’s okay.) Perhaps this is the catalyst to really send Ambrose over the edge? Here’s hoping he finds himself back in main eventer status because this rivalry with Bray Wyatt, I’m over it. Won’t lie, this match didn’t hold my attention. It was a bit on the predictable side with Alicia Fox returning to her crazy ways and Mizdow not being tagged in. Wait, he was tagged in and then immediately tagged right back out. Naomi on the other hand shown brightly. She is talented and should be in the hunt for the Diva’s title. But yet she’s here in 6 person tag team bouts. Okay so it was the next logical progression given the heat between the Usos and The Miz and his stunt double, but this rivalry has been beaten to death. But you know, we are going to get at least one tag team rematch between the Usos and the Hollywood A Lister and his stunt double. What I’d like to see though, bring in the Ascension. Liven this tag team division up. I’m bored again. This was a match well worth the wait. The Authority continued to reward those who fought against them once more with the living breathing future of the WWE, Seth Rollins as he looked to take down the insatiable Ryback. But no one said the Authority didn’t listen to its employees as they attempted to feed Ryback more, by making the match a 2 on 1 handicapped match by adding the Director of Operations Kane! The match was a lot of fun, and Ryback held his own against the onslaught from Kane and Mr. Money in the Bank. And was even able to take control of the match from Kane, but showing why he was the new standard barer, Seth took control back with a huge drop kick stunning the Big Guy. A series of quick tags kept Rollins and Kane at the top and Ryback reeling, but a lucky spine buster put the hungry man back on top. He was able to deliver his devastating meat hook clothes line to the WWE’s future and set him up for a Shellshock but it was Kane who made the save and attempted to choke slam Ryback. But the Big Guy had more fight in him as he reversed the chokeslam and was able to hit a shellshock on the Big Red Corporate Monster. However, Seth Rollins, our future champion, delivered two straight curb stomps to Ryback to pick up the win for what’s best for business. A huge match filled with explosive moves and high flying fun from Rollins. The man truly is a ninja. Teaming with Kane was actually a lot of fun to watch. And watching them dismantle Ryback was a huge blast of fun. I was on the edge of my seat on more than one occasion but it all turned out amazing in the end. Seth curb stomped his way to victory and pinned Ryback. It’s good when things go as planned. But with the way Kane keeps forgetting things, we may need to get him some help. Does this mean that Gold and Stardust aren’t feuding with the New Day anymore? Is it gonna be more 6 man tag with the New Day vs Adam Rose, Cesaro, and Tyson Kidd (with out Nattie, pretty please with sugar on top)? I can’t say I’m excited about this prospect. I can say I do like Tyson and Cesaro together though. So at least that’s a silver lining. Time to celebrate a hero! As much hell as I give John Cena, he did bring back the only people who can run the WWE as it’s meant to be run. The only two people that know what’s best for business. Triple H and Stephanie arrive in the ring and they bring out the only man who could have and did bring them back to full power. Through out the night, the WWE Universe was treated to career highlights of the face that supposedly runs the place. But the best high light was from last Monday night when Cena said those fateful words that handed the reigns of power back Triple H and Stephanie. But the party was incomplete in their eyes so they invited Erick Rowan, Ryback, and Dolph Ziggler to the festivities. They reiterated that those who fought against the Authority would get what they desereved and threatened suspensions without pay. But in the end they needed to talk amongst themselves to really decide what was most fitting for the men who fought against them. They made their way back up the ramp whispering about what they should do. In the end, the power couple made good on their promise from Survivor Series, and righted the final wrong, FIRING the three men who had been the heart of Team Cena. Can’t say they weren’t warned there would be consequences in siding with Cena. 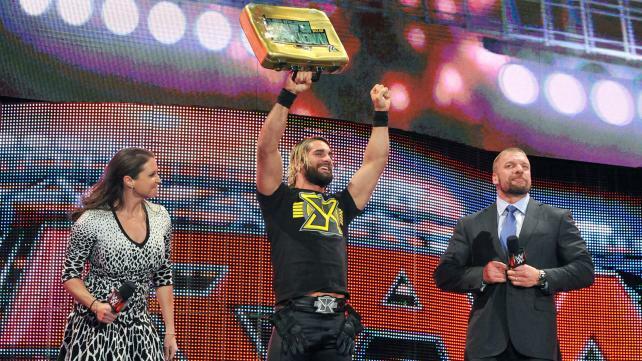 WWE: RAW Recap 1/19/15: RAW Reunion!!! WWE: RAW Recap! 2/16/15 Expect the Unexpected! This entry was posted on Tuesday, January 6th, 2015 at 7:05 pm	and is filed under Events, News, Television. You can follow any responses to this entry through the RSS 2.0 feed. You can skip to the end and leave a response. Pinging is currently not allowed. « ‘COACHELLA 2015’ Lineup Announced! [in the warehouse, seeing the Statue of Liberty in pieces] That's a big man. It is a lady. A French lady. [turning to see General Fang and her henchmen] She looks like an evilChinese warlord to me.